User research is global, yet despite its pervasiveness, practitioners are not all well equipped to work globally. What may have worked in Nigeria may not be accepted in Russia, may be done differently in Brazil, may partly work in China, and may completely fail in Kuwait. And what often goes less noticed, but can be equally vexing are technical, logistical and planning issues such as hiring qualified translators, payment procedures, travel issues, setting up facilities and finding test participants. 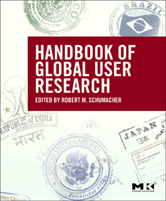 The Handbook of Global User Research is the first book to focus on global user research. The book collects insight from UX professionals from nine countries and, following a typical project timeline, presents practical insights into the preparation, fieldwork, analysis and reporting, and overall project management for global user research projects. Any user experience professional that works on global projects -- including those new to the field, UX veterans who need information on this expanding aspect of user research, and students -- will need this book to do their job effectively. CHAPTER 6 Global user research methods.